Island communities in Maine are seeing more than tourists this week. They're getting visits from the Maine Forest Service, trying to reduce the risk of wildfires. Since 2010, Forest Rangers have been making annual visits to the islands with the largest populations, such as Peaks and Great Diamond Island. They load up a wood chipper onto a barge, drive around the residential area, and pick up brush piles to turn into wood chips. The free service makes it easier for island residents to get rid of small pieces of wood that would be fuel for fires. "You have a lot of what we call fuels out here, vegetation, and obviously the access is very limited," said Forest Ranger Kent Nelson, who organizes the Defensible Space Chipping Program. The importance of the program was realized on Great Diamond Island in 2013, when a fire destroyed a multi-million dollar hotel. By the time the Portland Fire Department's fire boat and volunteers from other islands got the scene, the building was gone. "That was a little bit of a reality check," said Nelson. "You never know how far it's going to go, so it's best to be prepared." Nelson said the program gives rangers the ability to talk to more island residents and tourists about fire safety, while learning the lay of the land. Familiarity with the islands will help the Forest Service, should they have to respond to a wild fire on one of them. 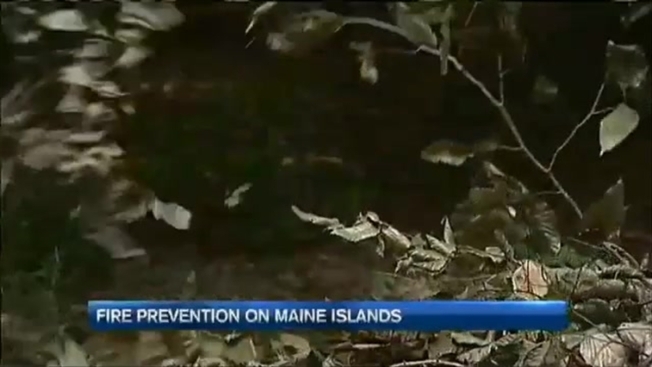 For more information on the Defensible Space Chipping Program, contact the Maine Forest Service.